Over the festive period and in January when work is quiet, I love to take the opportunity to spend extra time with my friends. Catching up over dinner and a few drinks around Christmastime gets us feeling extra festive. 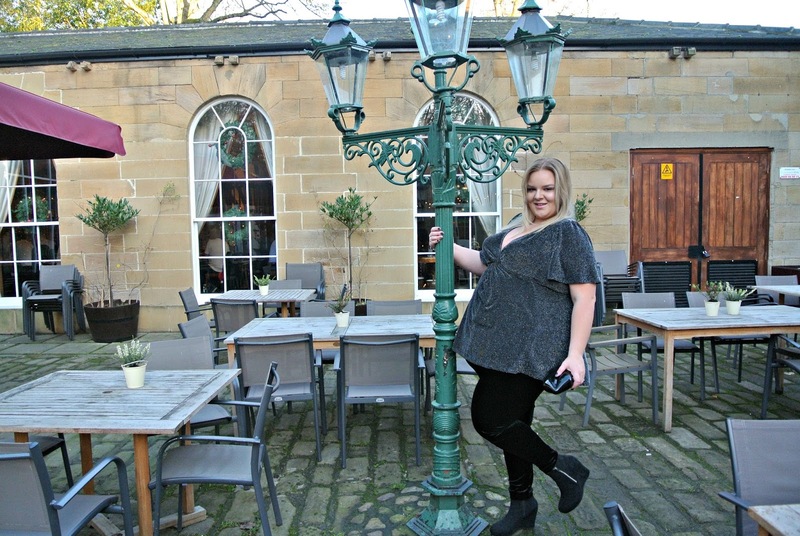 This year, we went to The Stables Restaurant at Beamish Hall because the service and food is always fantastic, they have a great selection of drinks and the atmosphere and ambiance is second to none. This cosy roaring fires, rustic wooden tables and twinkling warm white fairy lights. I picked an outfit from Scarlett and Jo to wear for the occasion. It was actually a mild day so a coat wasn’t necessary, especially when the car park and drop off points aren’t far to the door of the restaurant. My look was smart but comfortable with a hint of festive sparkle thanks to the Scarlett and Jo Twist Knot Lurex Tunic. Mine is black lurex with a sparking silver thread running through it but it is also available in couple of other black and metallic combinations. This tunic is the perfect addition to a winter wardrobe as it glitters but isn’t too OTT and it feels special and eye catching while still keeping you covered on colder evenings. It has floaty angel sleeves, an uber flattering v neckline and is long enough to cover the bottom, making it the perfect choice to wear with leggings or closer fitting trousers. This tunic is very comfortable and easy to wear as you can pop it on with some leggings, grab a clutch and add some heels and you’ll be ready with very little thought. I did find the centre seam running from the knot at the bust through to the bottom of the top to be a little odd; it bubbled and lay in an odd way which I didn’t find particularly flattering. For me, this tunic was very generously sized and especially roomy in the bust. My advice would be to size down with this one. You do need to be careful with this top as it does click easily so watch out with uneven surfaces, jewellery and embellished detailing. The leggings that I paired with this tunic have been a total hit with me all winter. The Scarlett and Joe Plush Velvet Leggings are warm and cosy but look luxe, stylish and bang on trend. There’s something about velvet that feels so plush and sumptuous. These are a great fit and look absolutely gorgeous. I’ve worn them so frequently with tops this winter; I even paired with with a black velvet bardot top for more of a lounge suit co-ord feel and the two together made a great set. While this outfit would look great with some strappy heels, I also thought it looked lovely with my affordable Deichmann Wedge Ankle Boots which, lets face it, are a far more comfortable option for an evening out. These boots aren’t too high at 3.5inches but thats actually a lot for me as I do tend to favour flat shoes for comfort plus I’m always frightened of going over on my ankle. These surprised me at how comfortable they actually are and every time I’ve worn them, I’ve been able to go the whole event without having to take them off or feeling as though my feet are burning. They have a platform at the front too which I think helps them to be more comfortable. While the heel of these shoes isn’t chunky in width, they do still feel sturdy underfoot. They’re made from a textured fabric that feels like suede. I like the rounded toe, which is again, very comfortable and I like that they fit close to my foot so that my feet aren’t swimming around inside of them which makes them feel more secure. My favourite thing about these boots is the zip detailing. They have a zipper on the inside to enable you to get in and out of the shoes but on the outside, they have a chunkier, silver zipper purely for aesthetics. The silver zip ties in nicely with the silver thread running through the tunic and the silver jewellery that I wore with the outfit. To add a touch of extra sparkle to my outfit, I popped on my Swarovski Stardust Deluxe White Double Crystal Bracelet which is a really beautiful and simple way to add a little more glitz and glam to a nighttime look, as well as my simple silver and clear crystal Chanel CC stud earrings, which are a staple in my jewellery collection. Although they’re something that I wouldn’t actually recommend as they’re really poorly made and the stones fall out of them so easily! For accessories, I opted for my glossy Lulu Guinness Black Lips Clutchwhich is my go-to clutch when I want something black but far from boring! Since I wanted the Scarlett and Jo tunic to be the main feature of this outfit, the clutch complimented it beautifully without detracting from the top. So there we have it, an outfit that proves that all black can be far from boring! What is your go-to winter night out outfit? You look gorgeous! Beautiful clutch, beautiful boots! You look great I love the sparkly top! Love the leggings and boots, you look very nice for a night out on the town! I especially like the lips handbag, nice touch! I love this! I love sparkly things but am always nervous about looking really tacky but this is perfect! Oh I am so in love with that tunic, it is gorgeous and loved how you styled it. The top and boots look gorgeous together! Love a mild winter day where a coat isn't needed! The tunic top is very pretty and goes really well with leggings. Bet it would be great with jeans too. You look great. You look so pretty! What a wonderfully styled outfit as always! I love your top, so cute. The shoes are great too.